Press release from Elmscot Nantwich Day Nursery. 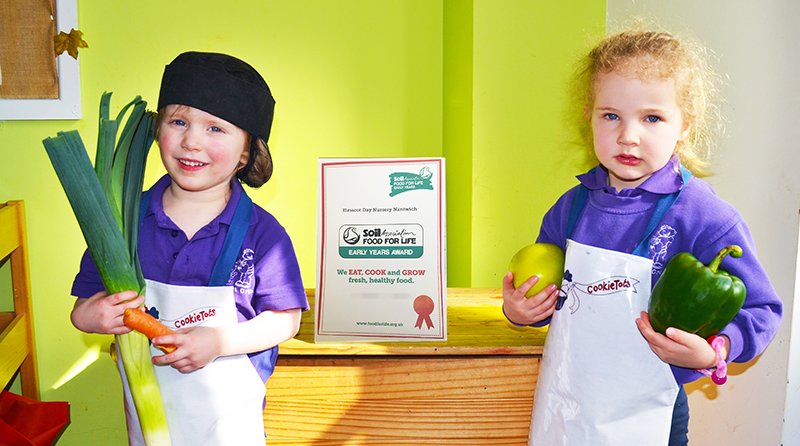 Elmscot Nantwich Day Nursery has gained the highly coveted Food for Life Award – promoting a healthy lifestyle in early years. The Food for Life Award is a national accreditation from the Soil Association that is awarded to schools and early years settings. It is designed to recognise settings that give children the best possible start by providing sustainable, fresh produce, as well as giving children opportunity to cook, grow and learn all about the food they eat. Elmscot Nantwich provided evidence to show they take pride in providing quality, freshly-prepared meals for all children in their care. Fruits, vegetables and meat are all sustainably sourced from local suppliers and all menus are approved by a paediatric dietitian. The children learn about where their food comes from and how to cook their favorite meals at nursery. Elmscot Nantwich is part of the Elmscot Group of Day Nurseries and Nursery Schools, which provide care and early years’ education within six settings across Cheshire. Dee McKenzie, Director at Elmscot Group said: “We are incredibly proud of the team at Elmscot Nantwich for achieving the Food for Life Award. They have worked hard to gain this accreditation and have created a great foundation for the future health and wellbeing of children in their care. Siân Creagh-Osborne, Food for Life Awards Programme Manager added: “I am very proud of Elmscot Nantwich for their hard work in achieving a Food for Life Early Years award. By meeting all of the criteria, they are demonstrating that they are not only providing the nutritious food that plays such a crucial role in a child’s development, but are enriching the curriculum through growing and cooking, giving every child in their care the best possible start in life.